There are quite a few off-the-shelf retro bikes, combining old world charm with the modern amenities that make motorcycling a pleasure. But what if you want a 50s bike just as it was, 50 years ago? With all the original parts? The 350 also has a sturdy cast-iron engine (again, probably unique amongst production bikes) and the gearbox is a separate unit. The icing on the cake is that it has the gears on the right, and the brakes on the left—just like old British iron. Definitely a feature no other current production bike has. The 350 retains other classic features such as drum brakes at both ends and a kick start, and an extra lever above the kickstarter: an automatic neutral finder. Above 100kph, the bike vibrates—so much so, that it reaches parts of the body that you didn’t think existed. But the sweet spot is at 80kph, when you discover what the essence of the 350 really is. Unless you ride it, it’s hard to explain the beauty of this thing: you sit ‘on’ the bike, and in India, when the legendary ‘thump’ is heard by others, they make way for you as if in the presence of royalty. I guess Kenny Rogers had the Bullet 350 in mind when he wrote They Don’t Make Them Like They Used To. 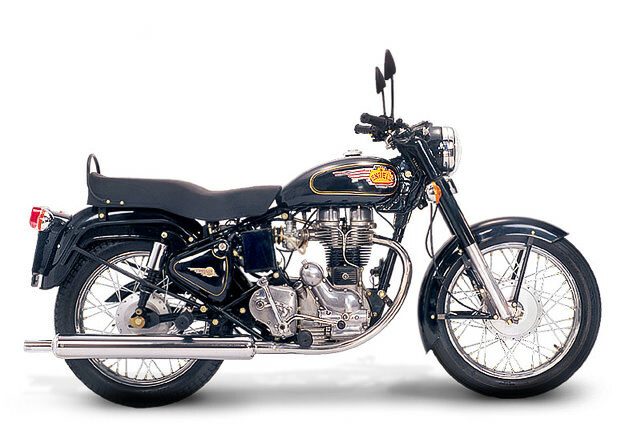 Visit the Royal Enfield Bullet 350 official website and be sure to check the newer, absolutely gorgeous Royal Enfield Continental GT cafe racer.